The wonderful world of catness. It’s truly a cat’s life so here are stories about our lives as modern cats. From the sublime to the ridiculous. 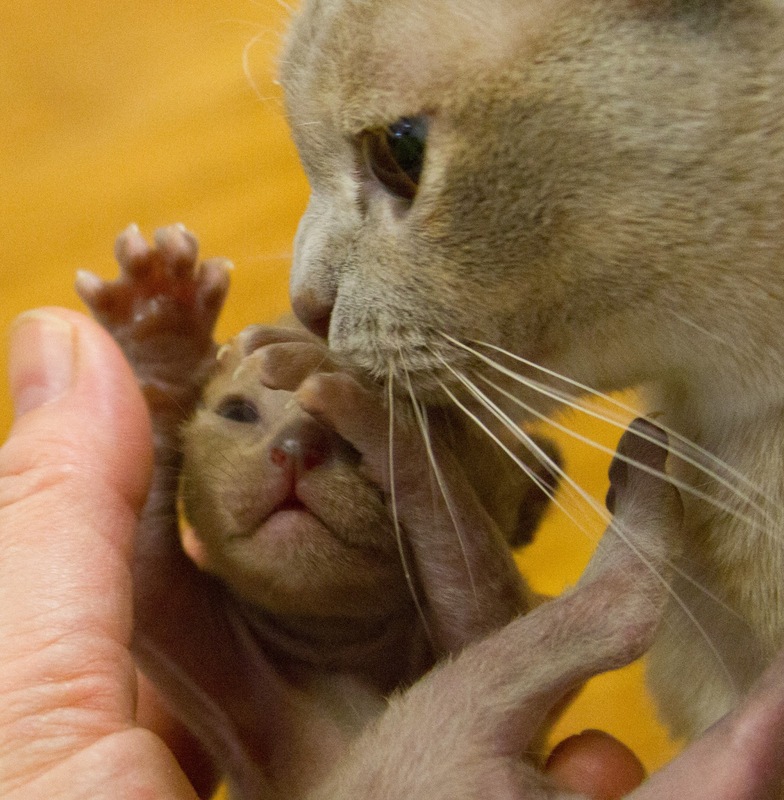 Is there anything quite as wonderful as the love of a mother cat for her kittens? 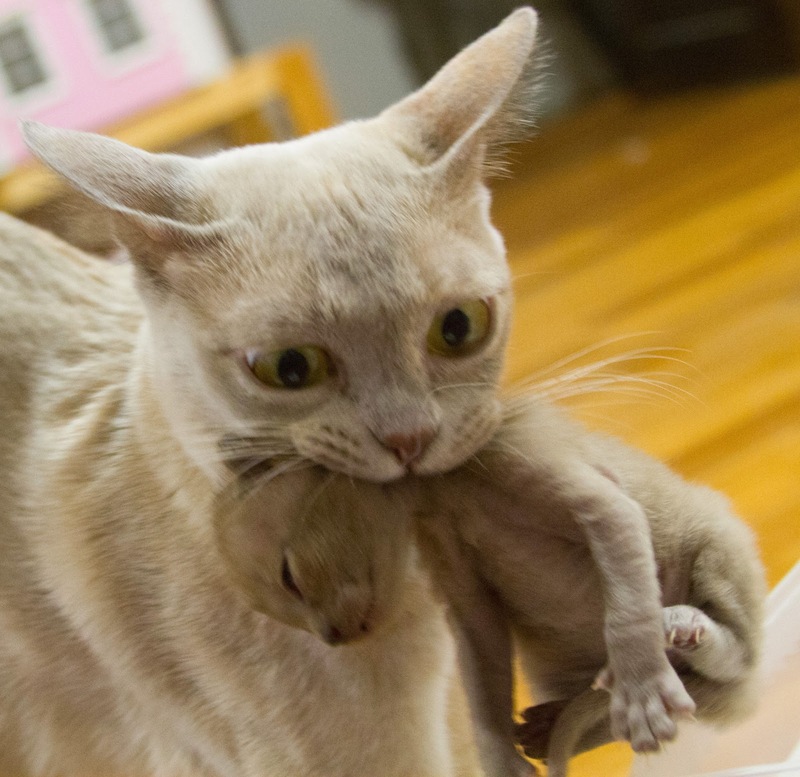 Isabelle from Kissmollin Cattery takes little Sampo away from Äiti’s hands. A few days later she’s rescuing him again. Maybe this doesn’t look so good but she is so very gentle. We can understand why Äiti keeps grabbing him and wanting to hold these tiny little bundles of joy, but methinks I should start to get a little concerned. Especially as she has this picture on her computer desktop. This is Chi, one of our household. he modelled for this painting a while back. We were quite jealous in fact, he got to eat a lot of cream that day as payment for his work! Anyway the painting ‘Lick Me!’ is now on an iphone cover! How fabulous is that? The humans entered him in the casetagram contest. It seems appropriate as he used that tongue a lot! The rest of us want to be immortalized now too. Vote for Lick Me in the casetagram contest. We have good news from Kissmollin Cattery. Jaava and Jura’s little nieces and nephews are growing fast. There were seven but sadly, one little kitten was not meant for this world and now there are 6 of them. 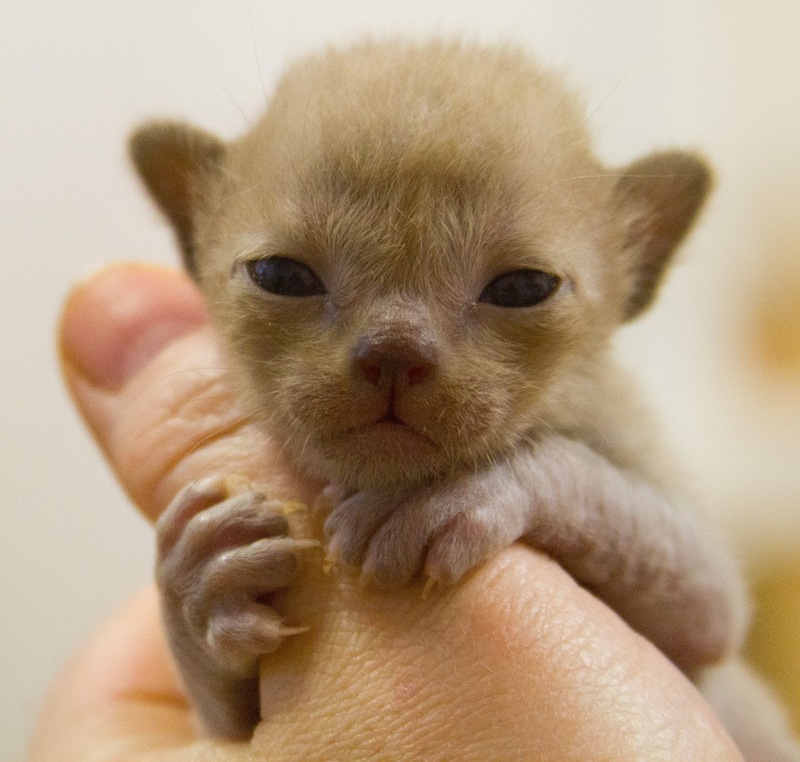 Mother Isabelle is doing very well – they are still teeny tiny so all paws are still crossed for them. Orlando the cat beats humans in an investments portfolio challenge! Need extra funds for that fancy scratching post you’ve been wanting for ages? Well how about doing a little financial investing? Orlando the ginger cat did that and not only made himself some extra funds but he also beat The Observer’s panel of stock-picking professionals in their 2012 investment challenge! How purrfect is that? The Observer portfolio challenge pitted industry professionals against students from John Warner School and Orlando the cat. Orlando chose his investments by tossing his toy mouse on a grid of numbers. He won! The pros were second and the students last. Excellent mouse skills Orlando! Read the full story here on the guardian website. Your foreign correspondent here from Finland(North). I live in an international household, with some Britcats. One had a rough life as a street cat in Bristol many years ago. Here we do not have free wandering cats as there are rules humans make. They are for our safety as we might get eaten by predators, and in winter it would be very hard for us to survive as the temperature drops to -30′C. So here it is much more common to have cats on leashes when they are outdoors, though of course it is us walking the humans holding them. I didn’t like the leash so much: it stopped me from stalking tasty snacks. So Äiti, that’s what we call our human, got loads of netting and wire. 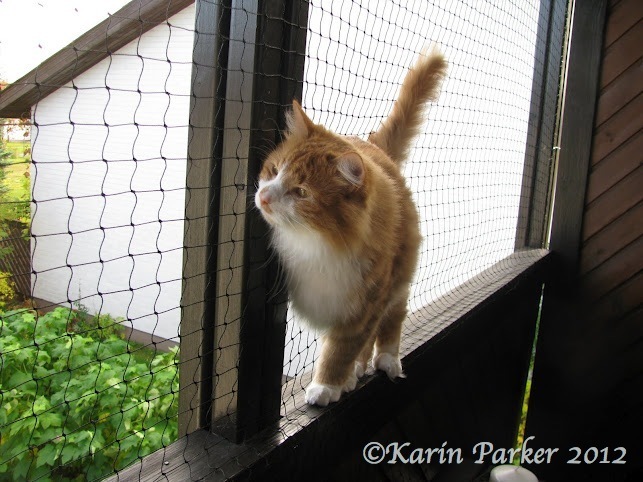 We now have a safe upstairs balcony and downstairs ‘catio’. Of course we’d like both to be bigger, but it’s a good compromise for us and humans. It’s also given our shy Britcats the opportunity to breath fresh air and feel the summer sun without the fear of cars. Generally we think it’s a great idea having the catio – except when the rest of the garden is full of birds and things we want to catch! There’s a new cat on the Downing Street block as Chancellor George Osborne and family welcomed back long lost Freya. Freya went missing from the Osborne’s Notting Hill house three years ago and was recently found living as a stray a few streets away. A microchip revealed her identity and she can now be seen sporting a sparkly new collar. Read more of the story on Your Cat Blog. Here in Finland we have a phrase, ‘kissan päivät‘ meaning cat’s days. These are the days when life is good – you have worked hard and can live off the fruits of your labours, and it is time to lay back and enjoy. It’s summer right now and we have no darkness here in Finland (north) so we have very long kissanpäivät. Time to stretch out and enjoy life. Just like Mirksu does here! A great job if you can get it! Hermitage Cats Today – YouTube.